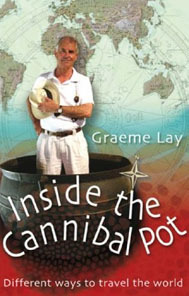 On a tiny, sun-fried island in Melanesia, where visiting tourists provide the only income for a cash-starved populace, for a few bucks you can 'Have Your Photograph Taken with the Cannibals and the Cannibal Pot'. It's a microcosm of modern tourism, where the norms of cultural sensitivity are often sideswiped by the practicalities of commerce. It's also one of many charming vignettes in a new book from acclaimed New Zealand writer Graeme Lay, each chapter offering a view on what it is like to be a modern traveller. He begins with an altercation with James Bond in Tahiti, which has him in indignant traveller mode. Visiting Asia for the first time, where his sense of culinary adventure is sorely tested, he finds himself to be a naïve traveller. Wearing his well-equipped traveller's hat, he sets out while in the UK to locate the source of the Thames. As an optimistic traveller, he tries to buy Viagra in Vanuatu – with interesting consequences. This is a travel book with a difference. Not about destinations per se, Inside the Cannibal Pot instead explores the whole notion of why and how we travel, and the often-hilarious and usually unplanned consequences. Like travel itself, the stories from Inside the Cannibal Pot will surprise and entertain at every turn.